The RM 028 Brown PVD has the same technical characteristics as its previous versions in titanium or titanium with a DLC coating: a skeletonized automatic movement, a rotor with variable geometry or the free sprung balance with variable inertia. A water resistance of 30 ATM (300 meters) is achieved with a three part case construction, required for diver’s watches and following diver’s watch ISO norms 6425. Its bezel is composed of three sections assembled with 22 torque screws for perfect adjustment and also adheres to ISO norms 6425. This bezel is unidirectional in order to avoid mistakes in diver’s calculations. This exceptional timepiece is easily distinguishable by its unique style. Minutes are orange as well as the screwed crown and the rubber strap. Only the first 15 minutes are in blue. The caseband and the caseback have been treated in brown PVD and have been satin finished. The unidirectional bezel, also brown PVD coated, is microblasted. The RM 028 is a very technical and efficient watch, uncompromising and using the best techniques from Haute Horlogerie and hand finishing traditions. 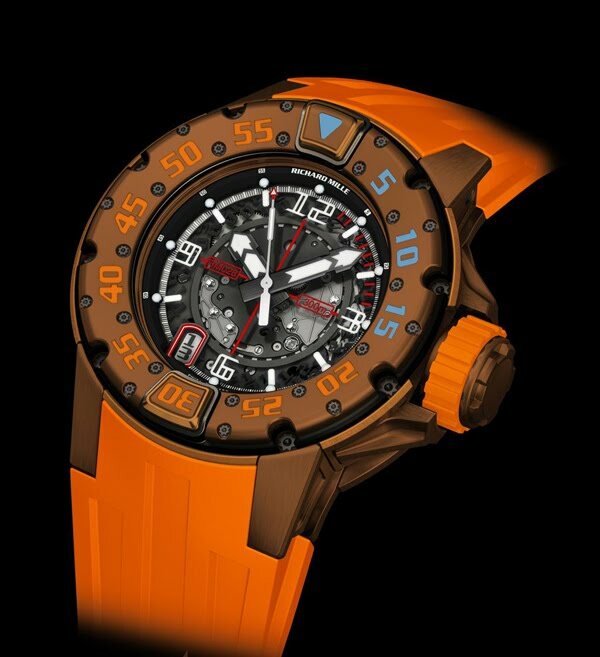 The RM 028 Diver’s watch Brown PVD will be available at Richard Mille retailers and Richard Mille boutiques.